No more downtime. No more malfunctions. With the right technology solutions, you can do more. We take the stress out of optimizing your office IT. Ascension IT is dedicated to helping your business achieve optimal productivity while reducing IT-related downtime by providing smart, proactive, and efficient information technology solutions, network assessments, resource planning, and managed IT services. At Ascension IT, we are committed to always employing a people-first, customer service-driven approach. We don’t formulate a managed service plan until we’ve sat down and discussed your unique business and its unique IT needs with you. Everything we do is tailored to ensure maximum customer satisfaction. schedule a complimentary assessment so we can discuss your business goals and tech challenges. prepares your detailed report outlining shortcomings, opportunities for improvement, and recommendations for moving forward. design and implement a managed service plan tailored to your needs together. We proactively monitor and maintain your systems, applying patches, protecting against viruses, ensuring backups are being successfully performed, and more. We’ll catch and fix the little problems before they become big ones – in many cases before you’re even aware of them. Of course, if anything does pop up, all of our managed service plans include regular, ongoing support. We are a team of Birmingham-based IT professionals, able to solve an issue remotely or make a timely, on-site visit to your office. 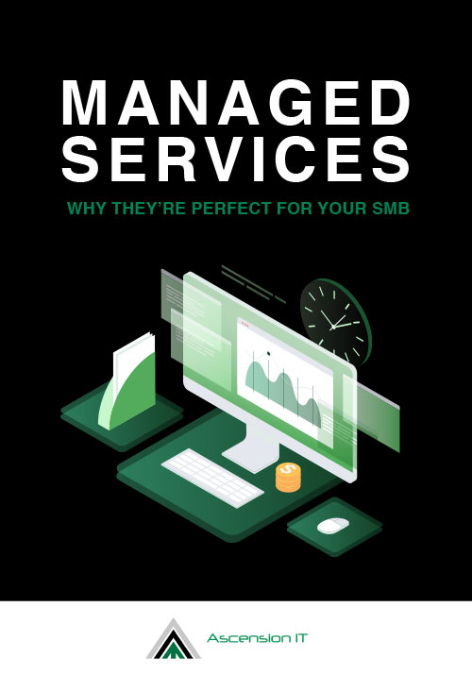 We believe every business can achieve more with the help of a Managed Services Provider (MSP), but you’ll need good information to make your own decision. That’s why we offer this free eBook. There are no strings attached — just fill out this form for your FREE digital copy. Hear what other Birmingham-based businesses say about partnering with Ascension IT. Ascension IT provides prompt and reliable service while going above-and-beyond in their customer service and project work. Reaching them for questions or problem-solving is easy since they are always a quick call or text away. Working with Ascension has been great. Their team is knowledgeable and easygoing, and they respond to issues, quickly. Other IT firms have never had the response time or dedication that we have experienced with Ascension IT. There is no comparison to the service and follow-up that they provide us. As a customer of Ascension for three years running, we have been consistently pleased with them throughout our entire relationship. Their team is ultra-responsive, flexible to our changing needs, and has shown a willingness to go above-and-beyond to solve our complex problems in a timely manner. They have allowed me to have peace-of-mind about our computer security and the knowledge that we are fully protected from compromises. Ascension IT has prevented downtime and revenue loss for us by their proactive approach to keeping our technology updated and protected. If any issues do come up, they are responsive and prompt in getting them resolved. Ascension IT facilitated moving our operations to the cloud and it has been a great benefit to our organization. They made the conversion seamless and gave us the peace of mind to not have to worry about future hardware upgrades. We now have the ability to access our data no matter where we are. Ascension IT gives me confidence that my systems are being set-up and monitored in a way that best benefits me and my company by being a reliable source to easily get my questions answered and assist in IT infrastructure planning. I believe Ascension IT has provided my engineering design firm the optimal setup to keep things running smoothly. The greatest benefit of being a client of Ascension IT is the level of personal service and attention to detail the I receive. In addition, they are fast, informed and take the time to invest in our professional relationship with them. I have no hesitation recommending Ascension IT to anyone looking for reliable IT services. The Ascension IT team is great! We no longer have to waste time trying to figure out what is wrong. The Ascension IT team is just a phone call/text/email away and are patient with non-IT savvy people. You will not regret your choice to work with Ascension IT! Whenever we have a problem, Ascension IT is extremely prompt and capable in their response and problem resolution. One particular benefit that we have experienced is Ascension IT’s familiarity with A/E related work, which has been a big benefit for our operations. We highly recommend Ascension IT and are very happy with the services they provide for us.